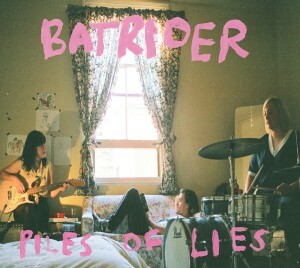 Batrider’s Piles of Lies is grungy and raw. And it doesn’t ever deviate from its grungy rawness. So, if that’s not your cup of tea, you’re not going to have a pleasant two hours and twenty minutes (as an aside, the band must be applauded for writing an album that doesn’t end before you realised it had started. It never ceases to bemuse me that artists release such relatively short albums, and tend to do it so infrequently – I mean I’m sure there’s much to fill the life of musicians that prevents them from actually writing music… but I digress). In the interests of disclosure, I am, generally, a fan of music that has been stripped down to its core like this has – garage rock, if you will. This album rejects the sound effects and synth so ubiquitous in today’s mainstream indie pop and instead rests a heavy foot on the distortion pedal to create its fuller sound. The voices of the band also contribute to Piles of Lies’ unique sound. In my last review, I rallied against the fact that many bands (often Australian it would seem) have a tendency to convert their native tones into a kind of one-size-fits-all, Americanised pronunciation. So it is now a pleasure to be able to review Batrider, a band that unashamedly announces its New Zealand roots for all to hear. Apart from the peculiar beauty of nasalised vowel sounds, this particular line shows that lyrically, Batrider has something different to offer. Clearly this isn’t your typical album about getting it on, breaking it off and variations thereof. There’s heartache in this record, but it is not clichéd. In many of the songs, the breaking vocals (see ‘Shine Your Light’) are the perfect partner to the screeching and wailing of the guitar. While such features may often be the hallmarks of some kind of musical ineptitude on a band’s part, they instead speak of Batrider’s sincerity on this album. However, as has been mentioned above, there really is little variation to be found in Piles of Lies, and even sincerity can get a tad weary after a while. By the middle of the album (around the song ‘Chunk’), I did find myself craving something a bit lighter…and it just didn’t come. My advice? Don’t be scared away – but do be prepared. This entry was posted in Featured, Music and tagged batrider, piles of lies. Bookmark the permalink.